Google has pleased internet freedom advocates, but angered Chinese authorities and drawn only muted support from the US government by halting censorship of search results in China. The internet firm is redirecting Google users in China to an uncensored site in Hong Kong, but analysts predict Chinese authorities will move quickly to block access to the site. "We very much hope that the Chinese government respects our decision, though we are well aware that it could at any time block access to our services," said Google's chief legal officer David Drummond in a blog post. This new approach of providing uncensored search is a "sensible solution" that is "entirely legal" and will meaningfully increase access to information for people in China, he said. Google intends to continue R&D work in China and also to maintain a sales presence there, Drummond said, but indicated that the company's sales force may be withdrawn if China blocks access to the Hong Kong site. 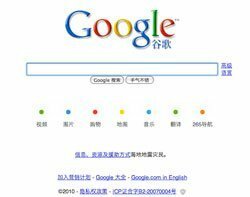 An official in China's state council information office said Google had reneged on its promise to abide by local rules and was wrong to end the censorship of is Chinese-language search service. Google's controversial move stems from the discovery that the company was among more than 20 US companies that were targeted by China-based cyber attacks. In January, Google threatened to stop censoring search results because of the surveillance of human rights activists connected with China, which investigations into the attacks uncovered. The US government has distanced itself from Google's decision by offering only indirect support. "We believe that freedom of expression and unfettered access to information are internationally recognised rights," the White House said. Analysts told the BBC that Google is unlikely to be affected in the short term by shutting down its search operation in China because it accounts for less than 2% of the firm's revenue. But any loss of business in China could affect Google's long-term growth because of the size and growth rate of China's internet population, they said.